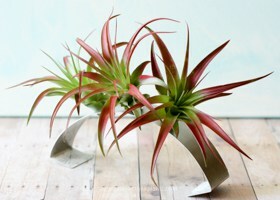 Air plants are a great choice for adding a clean, organically modern look for your decor. Not only do Tillandsia, commonly known as air plants, add a natural sculptural element but their versatility is second to none. 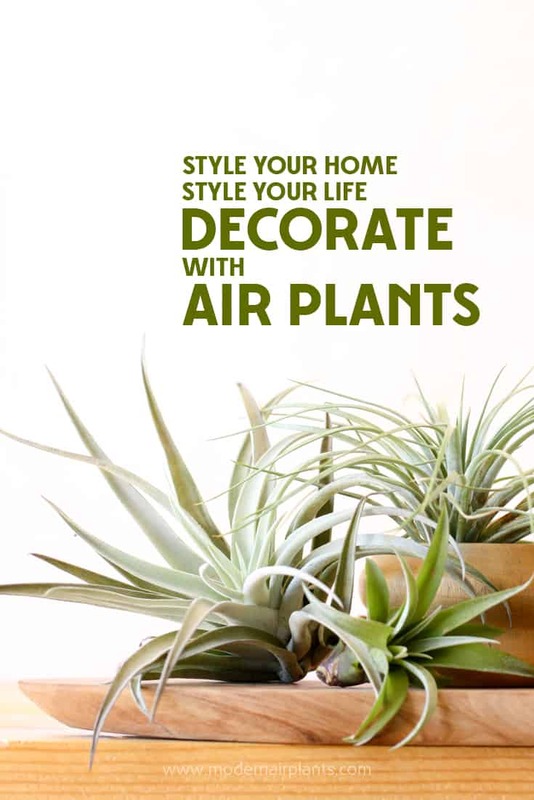 When decorating with air plants, begin by deciding which plants to use is really fun! For best results, begin with a design plan. 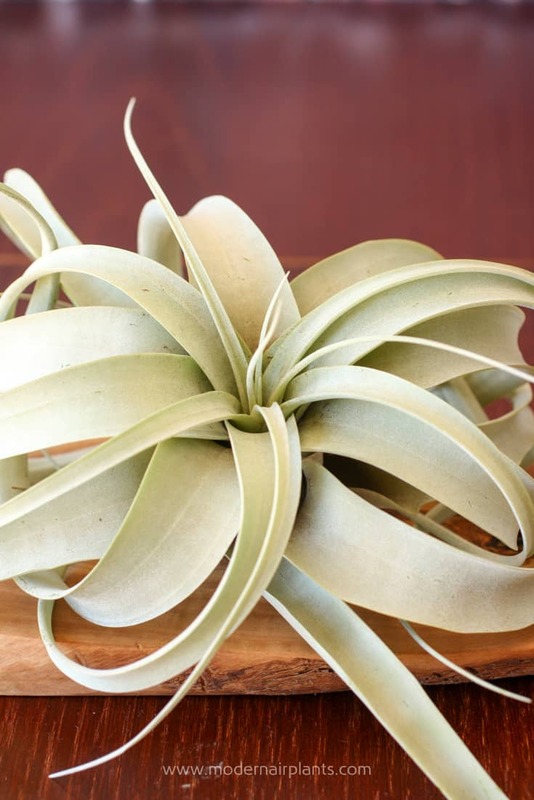 Rather than using several varieties of air plants, choose just one kind and stick with it. 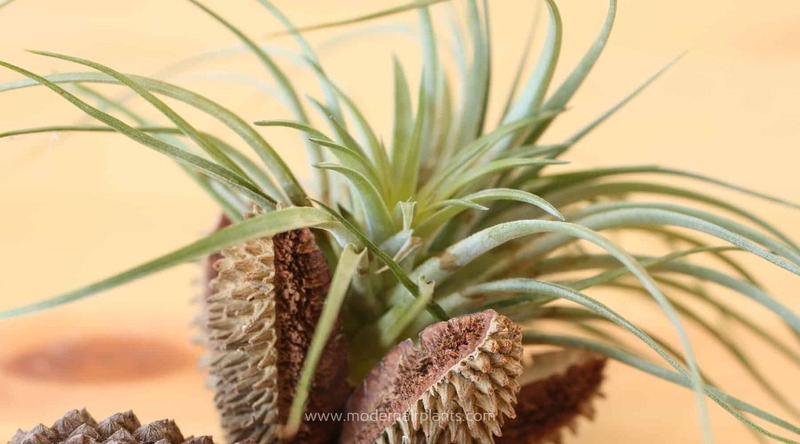 This will give your tillandsia decor more visual impact. It is also more soothing to the eye to see just one variety, rather than several different types all competing for our attention. Visually absorbing air plants with similar attributes harmonizes with our sub-conscious idea of beauty. Greater than the sum of its parts: this little trio of T. ioanthas has more visual impact than they would on their own and more than they would if they were different air plant varieties. 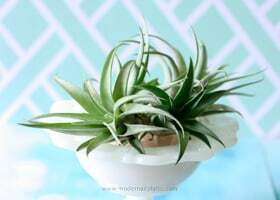 Another air plant decorating trick is to use different types of air plants with a similar attribute. The distinctive varieties may have echoing shapes, color or size. To add interest, be sure that there is something that contrasts the varieties. This display features peach capitata and red-tinted abdita. The similar shaped leaves ties the arrangement together and the complimentary colors, green and red, add visual interest. Many air plants are quite small. Using the air plants en masse can make the small appear larger. If you want larger, I recommend Tillandsia xerographica, also known as the queen of air plants, as it can be quite large. 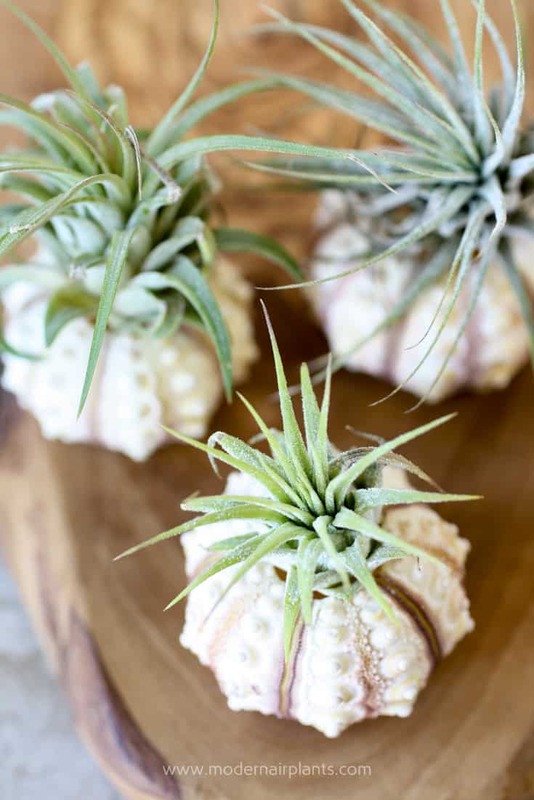 All on its own, this air plant is packed with eye appeal. Along with picking your plants, you’ll need to decide on the display medium. Rocks rock when it comes to highlighting the sculptural beauty of tillandsias. Using dry materials are not only ideal, but vital. 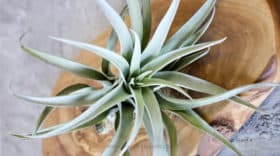 Wet strata will cause air plants to rot and die. Rocks, then, because of their dry nature, are perfect. Because the plants can be set right on the rocks it’s a cinch to remove the plants from soaking in water and air drying to returning to their gravely bed. And, rocks are available in many forms. Sand, pebbles and river rock make great substrates. With sand you can make a small indentation, just right for nestling you air plant into position. 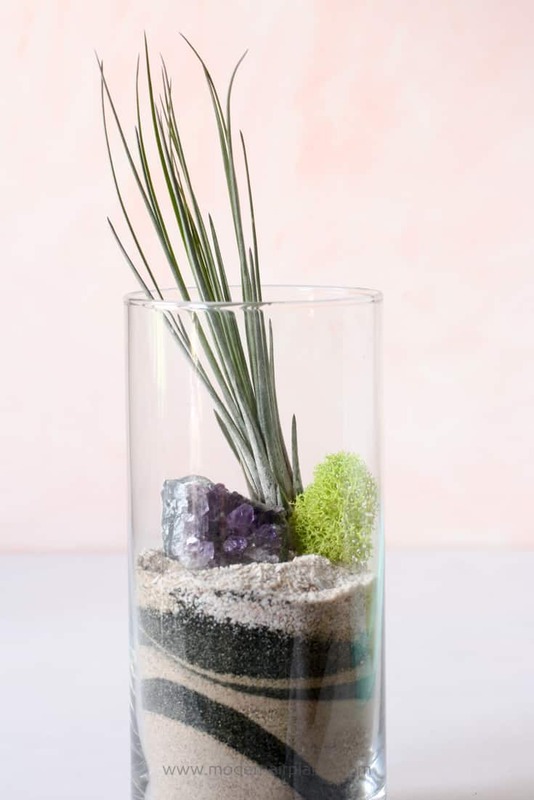 Try layering different colors in a glass container to add interest. The crevices between rocks are perfect for positioning air plants. Uncut gems, such as amethyst, set the mood for your arrangement. A single air plant placed on a cushion of sand accompanied by an uncut gem is as pretty as it is simple, and, of course, modern. This T. juncea looks right at home in this cylinder vase filled with sand, an amethyst and a bit of preserved moss. For most plants one of the first considerations is choosing the pot. 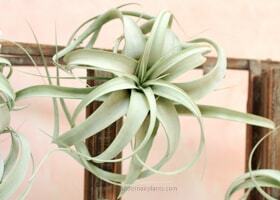 Air plants though, unrestrained by roots, don’t require pots. Instead, it’s like creating a stage for your air plants. This could be anything from a wood cheese board to fishing line to suspend them from the ceiling. 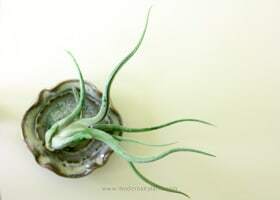 To get your wheels turning, check out my post on air plant containers. By the way, the term containers is used loosely. When decorating with air plants, your options are seriously limitless. With air plants you can easily mix things up by changing how you display them. If you’ve found the perfect display and want to keep it as-is, that works too. 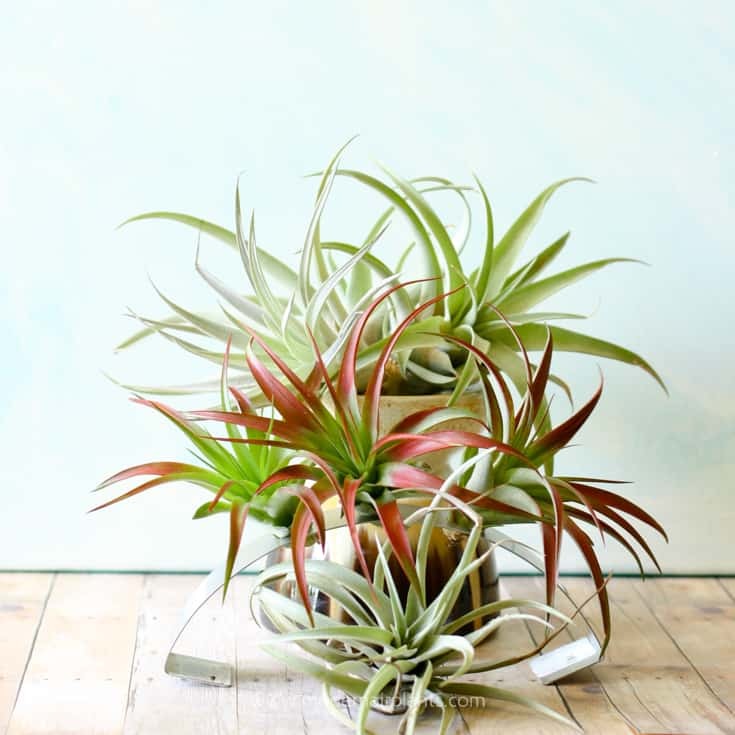 Whichever style you choose, you can’t lose with air plants!